These steps provide dramatic views and descent from the Lyndhurst Ridge. 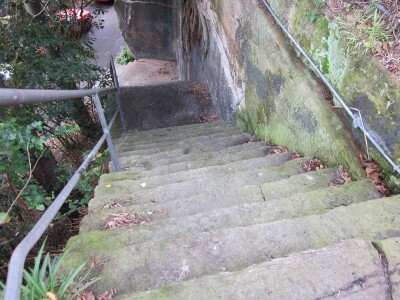 At a time when most people travelled on foot, steps were a quick, if not a very easy, way to move up and down the ridges, as can still be seen at the Rocks and Walsh Bay. At the end of Darghan St a set of steps leads down the cliff face to Railway St. From the top there are views north across Blackwattle Bay. Half way down a native fig tree clings to a gap in the strata, and the final flight of steps is carved from the living rock. The rock is Hawkesbury Sandstone and the man-made nature of the faces is evidenced by the presence of excavation blast holes and hand knapping. The hardness of the mainly massive sandstone is indicated by the close spacing of the blast holes. In the cross bedded phases the foresets dip to north-east. The face along Railway Street contains a major oblique joint. The date of these steps is unknown. At the latest, they would date from the building of the railway, and there is an underpass at the bottom that leads to lower Darghan Street. However, it is possible they date from the late 19th century when timber yards began to line the shores of Blackwattle Bay, providing a quick route for workers living in the Lyndhurst precinct. These yards were major employers until World War II. Turn left at the base of the cliff and walk along the secluded, leafy Railway Street until it joins Darling Street. Turn right under the railway bridge and cross Bridge Road at the lights. The City will soon build a boardwalk over the Bay in front of Blackwattle Secondary College, and when that happens this walk will be amended to include that possibility. However, at present the best option is probably to cross Taylor Street and proceed up the lane to Burton Street.